JIM MILLER/LAS VEGAS REVIEW-JOURNAL Liberty Patriot guard Alyx Stiff (3) takes a shot over Las Vegas Wildcat defender, center, Megan Munson(44) in their girls high school basketball match up on Tuesday, Dec. 6, 2011 at Las Vegas High School. The Liberty Patriots ran away with the game 64-24. JIM MILLER/LAS VEGAS REVIEW-JOURNAL Liberty Patriot center Dayanni Cochran takes a shot over Las Vegas Wildcat defender, forward, Jasmina Salas (24). 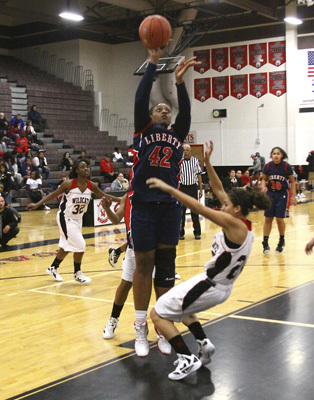 The two teams met in a girls high school basketball matchup on December 6, 2011 at Las Vegass High School. The Liberty Patriots won the game 64-24. Even Liberty girls basketball coach Quintin Lester will admit there was some concern this season about replacing the three senior guards who led the Patriots to the Class 4A state final last year. The answer, as evidenced Tuesday night at Las Vegas High, is no one and everyone. Liberty spread around its scoring, with seven players scoring at least five points each, and played exquisite defense en route to a 64-25 thumping of the host Wildcats. 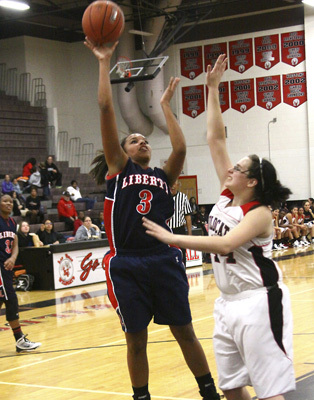 Liberty (2-0) lost seniors Amanda Delgado, Jade Washington and Destiny Whitehead to graduation in June. The trio combined to average nearly 40 points per game, and they provided leadership and stability on the floor. And while it’s difficult to find a true point guard on the Patriots’ roster, Liberty has plenty of size and scoring ability. Silverado transfer Tae’lor Monroe had 15 first-half points and carried the Patriots through the opening minutes until the team got untracked offensively. Monroe finished with 17 points. Chanel Nacua had nine points, and Dayanni Cochran and Meme Clark each scored eight for Liberty. Nacua and Clark grabbed 10 rebounds apiece as Liberty finished with a 54-31 edge on the boards. Though Liberty’s offense went through small stretches where it stuttered, the team’s defense couldn’t have been much better. Liberty’s full-court trap in the first half and second-half half-court trap frustrated the Wildcats, who finished 5 of 43 from the field and committed 27 turnovers. Las Vegas came into the game averaging 62 points in its first two games. “That’s something we try to pride ourselves on,” Lester said of the defense. Matti Ventling led Las Vegas (1-2) with nine points, six of those from the free-throw line.